Chapter members and others continue maintenance work and place flags on patriot graves. 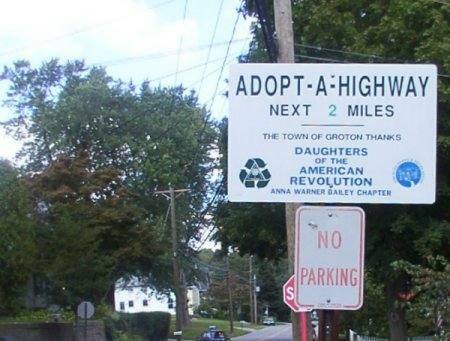 Proclamations from the City of Groton and Town of Groton. Chapter members proudly fly their flags! Members collect and donate soup labels, boxtops, cell phones. Our chapter participates in the Excellence in American History program. Each year we give the awards to eighth graders. The ROTC Medal is awarded at the US Submarine Force Museum each year to a student cadet of outstanding ability and achievement. Our chapter participates in the DAR Good Citizen program. Each year, we select a Good Citizen award recipient from a local high school. Members make and donate lap robes for the Elderly. Our members knit hats for chemotherapy patients and sew pillows for those on dialysis at Lawrence & Memorial Hospital. We plant flowers, azaleas, and place flags around the stone. 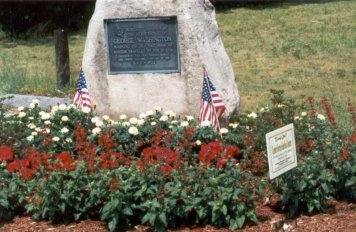 The stone is "Dedicated in honor of the Bicentennial of George Washington marking the Old Post Road to Boston traveled by him in 1756." We provide various holiday decorations throughout the year. Family Gifts are donated for family members and for them to give others. We also provide books, clothes, and other items.